Since there was some interest this year in reading poetry, at least one poetry book, for a reading challenge. I’ve decided to renew the challenge for 2012. 1. 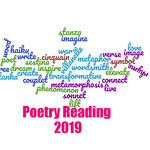 Create a post on your blog stating your intention to read poetry in 2012 and sign up in Mr. Linky. If you don’t have a blog, simply leave a comment about reading poetry in 2012.
a. Read and review up to 2 books of poetry throughout 2012 and leave the full link to each review in Mr. Linky. b. Participate in at least 3 Virtual Poetry Circles throughout the year. 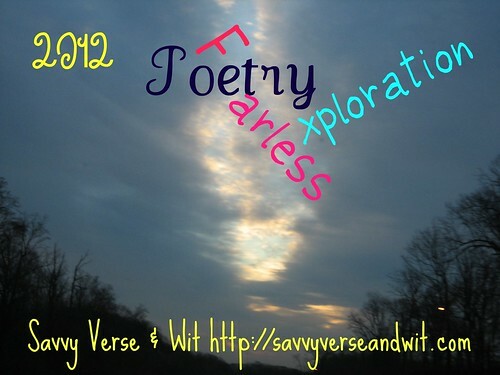 c. Sign up to feature poetry on your blog for April’s National Poetry Month as part of Savvy Verse & Wit’s Blog Tour. d. Or some combination of the above. 3. Complete your goals between Jan. 1, 2012, and Dec. 31, 2012. Thanks for making poetry part of your reading, and I look forward to your reviews. Serena, this is just what I was looking for, I’m glad I saw it on Anna’s blog. I will do a very nice intro post at the beginning of January. I think it’s sad that people don’t read more poetry. They don’t know what they miss. I like all three of your options. This year I will start to translate poems. It’s a project I had in mind for a while now and that goes nicely with this challenge. I am so glad that you’ll be joining the challenge. I really love poetry, and I cannot stop making others believe it is wonderful too. Wow, translating poems will be a tough task depending on what poets you are doing and what languages. I hope you enjoy it. Please could you explain a bit more what is involved in the Virtual Poetry Circles, because I don’t really understand it? Thanks! Connie, All you have to do is read the poem posted and talk about what you think about the poem in the comments, like what lines or images you liked. Stuff like that. Its very low key. The poems are posted on Saturday mornings. Thanks for this challenge, Serena. I will definitely be taking part. I’m already looking forward to National Poetry Month – it was such a blast last year! I’m glad that you’ll be joining. I’m trying to expand it into things other than reviews. I hope I get more participants. Great! I’ll definitely be joining again. Still figuring out what challenges I will be taking part in, but I will post soon. I hope I get more participants in the new year. I’d like to see more poetry out there on the blogs!